The Mobile Device Software Development Contract is used for software development projects for mobile devices. It is used as the starting point for any type of specialty mobile device software project. service has impressed me greatly and your argument that it will make the solicitors service cheaper is a very valid point. I must agree that your templates look very good and due to this and especially due to your excellent customer service I will be purchasing your product. Thank you." This Mobile Software Development Contract is included in editable Word format that can be customized in Word or by using the included Wizard software. THIS AGREEMENT is made this Current Day day of Current Month, Current Year by and between Company Name ("Developers") and Company Name ("Customer"). Developers have experience and expertise in the development of Mobile Software ("Mobile Software"). Customer desires to have Developers develop Mobile Software for it. Developers desire to develop Customer's Mobile Software on the terms and conditions set forth in Exhibit B attached hereto (the "Specifications"). "Deliverables" shall mean the Mobile Software provided in object and/or source format (as set forth in the Specifications and subject to Developers' Proprietary Rights), documentation, or other materials required to be delivered by Developers to Customer, as set forth in the Specifications. "Critical Deliverables" shall mean Deliverables that have a Milestone date, as outlined in the Specifications, that must be transmitted to Customer on or before a specific date. "Source Code" shall mean the readable forms together with make and build files. "Beta" shall mean any and all Deliverables provided to Customer prior to the Launch Date. "Final" shall mean any and all Deliverables provided to Customer that are in accordance with the Specifications and accepted by Customer as completion of a particular Deliverable. "Launch Date" shall mean the date that the Product is first available for use by the public. "Mobile Software" shall mean the Mobile Software program(s) described in the Specifications that are to be developed by Developers, including all Enhancements made under this Agreement. "Mobile Device" shall mean all hand-held, touch screen or other portable devices on which the Mobile Software shall operate. A full list of such devices shall be contained in Exhibit B. "Mobile Browser" shall mean device-specific browser technology which the Mobile Software shall be displayed on or run from. A full list of such devices shall be contained in Exhibit B. "Product" shall mean Mobile Software for a computer or an end user. "Schedule" shall mean the schedule(s) for completion of the Deliverables, as set forth in the Specifications. "Delivery" shall mean transmitted by Developers to Customers electronically and in accordance with security measures agreed upon by both parties in accordance with the Specifications. "Services" shall mean any training, customization, enhancement or other labor performed by Developers as required by the Specifications. "Error(s)" shall mean malfunction(s) or defect(s) within the Mobile Software or within a Deliverable that prevents that software from conforming to the Specifications. "Internet" shall mean any system for distributing digital or electronic information to end users via transmission, broadcast or any other form of delivery, whether direct or indirect, known or subsequently developed. "Mobile Network" shall mean any network in which a connection to the Internet is delivered through to a Mobile Device. "Mobile Plug-ins" shall mean all software required by Mobile Devices in order to run the Mobile Software. "Specifications" shall mean the specifications for the Product and Services, attached to this Agreement as Exhibit B, which shall include detailed specifications and instructions for all required Deliverables, features and functionality, and a complete production schedule for each Deliverable and Milestone. "Term" shall mean the period of time commencing on the Effective Date of this Agreement and continuing indefinitely until this Agreement is terminated. "User Interface" shall mean all navigational devices, menus, menu structures or arrangements, icons, visual mechanisms, metaphors or help and other operational instructions, and all other components of any source or object computer code that comprises the Mobile Software. "Web" shall mean the World Wide Web, containing pages written in hypertext markup language (HTML) and/or any similar successor technology. "Web Page" shall mean any document that may be viewed in its entirety on the Web. "Web Site" shall mean a collection of interrelated Web pages or documents accessible through a Web page browser, interface or any other similar successor technology. "Mobile Site" shall mean any collection of interrelated Web Pages or documents which have been specifically created or formatted for Mobile Devices or specifically for the Mobile Software. "Developer's Proprietary Material" shall mean all intellectual property rights in any text, images or other components and/or materials owned by Developers, or which Developers have the legal right to use, that are delivered to Customer; including but not limited to Mobile Software, related documentation, source code, scripts, object code, logos, graphics or tag lines. "Customer's Proprietary Material" shall mean all intellectual property rights in any text, images or other components and/or materials owned by Customer, or which Customer has the legal right to use, that are delivered to Developers, including but not limited to Mobile Software, related documentation, Customer marketing material, logos, graphics or tag lines. "Developer Code" shall mean all Developer's Proprietary Material or Mobile Software Source Code existing as of the date of this Agreement that is to be incorporated into the Source Code of the Product. The license terms for Developer Code will be stated in the Specifications. "Documentation" shall mean all user guides, reference, integration, installation or implementation manuals that describe in detail the operation of the Mobile Software and which are normally provided by Developer as part of its deliveries to its customers. "Development Activities" shall mean any activities undertaken by Developer in the development of the Mobile Software and Documentation satisfying the Specifications pursuant to this Agreement. "Enhancements" shall mean error corrections, bug fixes, modifications and updates not included in the Specifications with respect to the Mobile Software. "Milestone" shall mean each development or Deliverable reached by Developers and agreed upon in writing between Developers and Customer. "Milestone Payment" shall mean a payment obligation related to the achievement and acceptance of a particular Milestone. "Acceptance" shall mean completion of a Deliverable that conforms to the Specifications and is mutually agreed upon in writing by both Developers and Customer. Developers agree to complete the installation, management, documentation and development of the Mobile Software and Mobile Software-based operations according to the compensation terms listed on Exhibit A attached hereto. Developers agree to develop the Mobile Software pursuant to the Specifications set forth in Exhibit B attached hereto (the "Specifications"). Developers will use reasonable diligence in the development of the Mobile Software and endeavor to deliver to Customer operational Mobile Software no later than Delivery Date. Customer acknowledges, however, that this delivery deadline and the other payment milestones listed in Exhibit B are estimates and are not required delivery dates, unless otherwise noted in the Specifications. Deliverables defined as "Critical Deliverables" shall be outlined in Exhibit B and shall contain the delivery date and terms of delivery of the Critical Deliverable. Developers will retain the Source Code for the Mobile Software and provide Customer with the output formats only. The output is to be used only within the scope of the Mobile Software as outlined in Exhibit B and does not include the following: replication, duplication or otherwise copying the Mobile Software in any form not authorized by Developers; creating new Mobile Software based on the code, its functions or other Proprietary Rights as outlined in Paragraph 4; sale or distribution of the code in any form; or any relinquishment of copyright by Developers in any way. Except for Customer's Proprietary Material (defined below) contained in the Mobile Software, Developers shall hold all rights, title, and interest in and to the Mobile Software. Specifically, but without limitation, Developers shall hold all rights, title, and interest in and to (1) all text, graphics, animation, audio components, and digital components of the Mobile Software (the "Content"), (2) all interfaces, navigational devices, menus, menu structures or arrangements, icons, help and other operational instructions, and all other components of any source or object computer code that comprise the Mobile Software, (3) all literal and nonliteral expressions of ideas that operate, cause, create, direct, manipulate, access, or otherwise affect the Content, and (4) all copyrights, patents, trade secrets, and other intellectual or industrial property rights in the Mobile Software or any component or characteristic thereof. Customer shall not do anything that may infringe upon or in any way undermine Developers' rights, title, and interest in the Mobile Software, as described in this Paragraph 4. Notwithstanding the above, Customer shall retain and Developers shall have no Proprietary Rights whatsoever in all of Customer's intellectual property rights in any and all text, images or other components and/or materials owned by Customer, or which Customer has the legal right to use, that are delivered to Developers, including but not limited to Mobile Software, related documentation, Customer marketing material, logos, and tag lines ("Customer's Proprietary Material"). Developers agree that they shall not use Customer's Proprietary Material for any purpose other than those expressly set forth in this Agreement. Mobile Software Development and Services described here are provided for Android, iPhone, Windows Mobile, Sun and Linux, Windows, Macintosh, Sun Solaris, UNIX systems only unless otherwise specified. Insert device specific information here. Unless otherwise agreed upon by Developers and Customer, any modifications required to the Mobile Software, code or other component related to its operation that are a result of third-party changes to resources required by the Mobile Software shall be considered ADDITIONAL and will fall outside of the Specifications. Third-party modifications may include but are not limited to: patches, fixes, security flaws, errors, updates, upgrades or any other changes to third-party operating systems, plug-ins or any required resources not created by Developers. Developers and Customer acknowledge that at some time during the Term of this Agreement that enhancements to the Mobile Software may be proposed by either Developers or Customer which fall outside of the scope of the Specifications. Upon such proposal, Developers shall confer in good faith with Customer concerning the feasibility of developing such enhancements and the time frame for developing, testing and incorporating such enhancements. Developers and Customer shall mutually agree in writing as to whether Developers shall pursue the development of such enhancements, and, if so, which party will fund such development. The Specifications will be amended to include such enhancements. Developers will maintain off-site storage of all stages of the Source Code and other backup media related to this Agreement to ensure Mobile Software integrity and protection, and will be responsible for setting up a daily procedure for backing up all data. Developers agree to update all backups of code on a daily basis unless otherwise agreed upon in the Specifications. Backups will be maintained for one (1) year from the acceptance date of the project. The terms and conditions contained in this Section will apply to the initial release of the Mobile Software, as well as to subsequent releases, upgrades, enhancements or any other versions thereof. Customer shall evaluate any beta or final version(s) of each Deliverable and shall submit an acceptance or rejection to Developers within Days days after Customer's receipt of an agreed-upon transmission of each Deliverable. Developers agree to thoroughly test the Mobile Software Product (including without limitation each and every release, version, and enhancement thereof), as appropriate under the circumstances, at all appropriate stages of development, and shall document their testing by written test documents delivered to Customer. Developers will submit their test plans to Customer, including a list of all devices the Mobile Software is to be tested on, so as to ensure that Customer's standards of quality are maintained, and Developers agree to subsequently modify the test plans to accommodate Customer's requests if Customer reasonably deems this necessary. Quality Assurance or test documentation shall include detailed descriptions of the tests conducted, their results and any outstanding or unresolved issues. Developers will not deploy the Product, Mobile Software or any enhancement thereof, unless Customer and Developers agree upon such action in writing. If Developers fail to transmit any "Critical Deliverable" within the dates specified in the Schedule or fail to meet a Milestone as defined in the Specifications, then a Breach of Agreement ("Breach") shall be considered to have occurred. Customer may: (1) amend the Schedule to include a correction period; or (2) suspend the Schedule until the problem is corrected at the sole expense of Developers subject to Customer's reasonable satisfaction; or (3) terminate this Agreement. Delivery of all Deliverables not defined in the Specifications as "Critical Deliverables" shall be considered estimates and delivery shall not be subject to Breach. Developers shall not be held responsible for any delays due to milestones missed by Customer, delays due to Customer Deliverables, or delays due to transmission, equipment failure, strikes, riots, disasters, or other natural occurrences. Developers will be available to respond to Customer's questions about Mobile Software and Mobile Software problems. Developers will staff a help desk with a combination of phone and email support services from 9:00 am to 5:00 p. Monday through Friday Time Zone. Developers will be responsible for maintaining an ongoing log of support requests and actions taken, and for tracking user support requests to completion. Support relating to Mobile Networks or Mobile Devices may fall on the individual Mobile Network or Mobile Device Manufacturer. For all of Developers' services under this Agreement, Customer shall compensate Developers, in cash, pursuant to the terms of Exhibit A attached hereto. In the event Customer fails to make any of the payments referenced in Exhibit A by the deadline set forth in Exhibit A, Developers have the right, but are not obligated, to pursue any or all of the following remedies: (1) terminate the Agreement; (2) remove equipment owned by Developers, whether leased to Customer by Developers or not, and remove any Developers' Personnel or Staff from Customer location(s); (3) bring legal action; or (4) suspend development of the Mobile Software, in which case Customer is responsible for any schedule changes required and additional financial impact. Customer and Developers acknowledge and agree that the Specifications and all other documents and information related to the development of the Mobile Software (the "Confidential Information") will constitute valuable trade secrets of Developers. Customer shall keep the Confidential Information in confidence and shall not, at any time during or after the term of this Agreement, without Developers' prior written consent, disclose or otherwise make available to anyone, either directly or indirectly, all or any part of the Confidential Information. Developers warrant that the Mobile Software will conform to the Specifications. If the Mobile Software does not conform to the Specifications, Developers shall be responsible to correct the Mobile Software without unreasonable delay, at Developers' sole expense and without charge to Customer, to bring the Mobile Software into conformance with the Specifications. This warranty shall be the exclusive warranty available to Customer. Customer waives any other warranty, express or implied. Customer acknowledges that Developers do not warrant that the Mobile Software will work on all platforms. Customer acknowledges that Developers will not be responsible for the results, productivity or any other measurable metric not specified in Exhibit B, obtained by Customer on the Mobile Software. Customer waives any claim for damages, direct or indirect, and agrees that its sole and exclusive remedy for damages (either in contract or tort) is the return of the consideration paid to Developers as set forth in Exhibit A attached hereto. Developers will monitor the reliability and stability of the Mobile Software for a period of up to 30 days to ensure that it performs in accordance with the Specifications. If modifications are required at any time, Developers will confer in good faith with Customer concerning the appropriateness of any modifications and mutually agree whether or not to make such modifications; provided, however, that such agreement will not be deemed to relieve Developers from their obligations to ensure that the Product continues to conform to the Specifications and compensation estimates as specified in Exhibit A. Developers shall be retained as independent contractors. Developers will be fully responsible for payment of their own income taxes on all compensation earned under this Agreement. Customer will not withhold or pay any income tax, social security tax, or any other payroll taxes on Developers' behalf. Developers understand that they will not be entitled to any fringe benefits that Customer provides for its employees generally or to any statutory employment benefits, including without limitation, worker's compensation or unemployment insurance. Customer agrees to make available to Developers, for Developers' use in performing the services required by this Agreement, such items of hardware (including specific mobile devices or devices run on specific mobile networks) and related Mobile Software as Customer and Developers may agree are reasonably necessary for such purpose. A detailed list of such equipment requirements shall be included in Exhibit B. This Agreement shall be binding upon and inure to the benefit of Customer and Developers and their respective successors and assigns, providing that Developers may not assign any of their obligations under this Agreement without Customer's prior written consent. Customer has no right to assign, sell, modify or otherwise alter the Mobile Software, except upon the express written advance approval of Developers, whose consent can be withheld for any reason. In the event Customer fails to make any of the payments set forth on Exhibit A within the time prescribed in Exhibit A, Developers have the right to remove the Mobile Software until payment in full is paid, plus accrued late charges of 1 1/2% per month. Developers warrant that the Mobile Software will conform to the Specifications, or such other Specifications as are agreed to in writing by Developers, for a period of thirty (30) days from the date of completion of the Mobile Software. If the Mobile Software does not conform to the Specifications, as Customer's sole remedy, Developers shall be responsible to correct the Mobile Software without unreasonable delay, at Developers' sole expense and without charge to Customer, to bring the Mobile Software into conformance with the Specifications set forth in Exhibit B. This warranty shall be the exclusive warranty available to Customer. Customer waives any other warranty, express or implied. Customer acknowledges that Developers are not responsible for the results obtained by Customer on the Mobile Software. Customer acknowledges that Developers are not responsible for fixing problems, errors or omissions on the Mobile Software after Customer has tested, proofed and approved the Mobile Software and either a written approval has been given to Developers or the Mobile Software has been mass produced or transmitted in the Public Domain in any way. Customer waives any claim for damages, direct or indirect, and agrees that its sole and exclusive remedy for damages (either in contract or tort) is the return of the consideration paid to Developers as set forth in Exhibit A attached hereto. No action, regardless of form, arising out of any claimed Breach of this Agreement or transactions under this Agreement may be brought by either party more than one (1) year after the cause of action has occurred. Developers will have no responsibility for any third party disrupting, intruding or otherwise copying files or reverse engineering in part or in whole on all or any part of the Mobile Software at any time. Developers will have the exclusive rights in making any derivative works from any of their work, practices, coding, programming or other work on the Mobile Software that is related to their pre-existing Developer Code as outlined in the Specifications. Customer agrees that Developers' identification may be annotated within the code as the authors. Customer also agrees to put Developers' copyright notices on the Mobile Software and the relevant content therein. Developers are not responsible for any down time, lost files, lost productivity, improper use or any other loss that may occur in the operation of the Mobile Software. In the event Developers are unable to continue maintenance and support of the Mobile Software, non-exclusive rights to the Mobile Software will be granted to Customer. This transfer shall not include the transfer of third-party Mobile Software or tools used by Developers in the creation or maintenance of the Mobile Software or any part thereof. 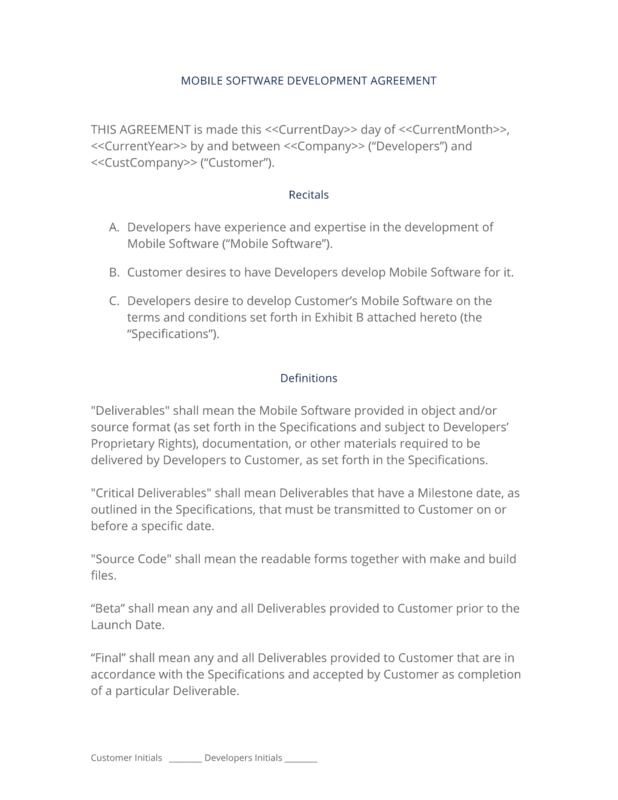 The complete Mobile Software Development Contract - with the actual formatting and layout - is available in this Contract Pack.